Before you know it...you'll be looking for a decent pair of shorts or crops in your messy closet. The weather will suddenly warm up, and you have no idea of what to wear. This happens because you failed to plan. 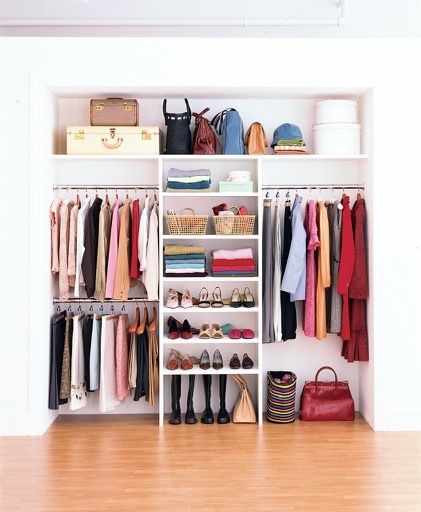 Let's organize our closets now. It's the best way to properly prepare for the season ahead. While it's not yet warm enough to rock a breezy sundress, by prepping now; transitioning into the new season will be much easier. Advanced planning is easier on your budget too (if you need something-buy it before you need it). Plan on also being more stylish! 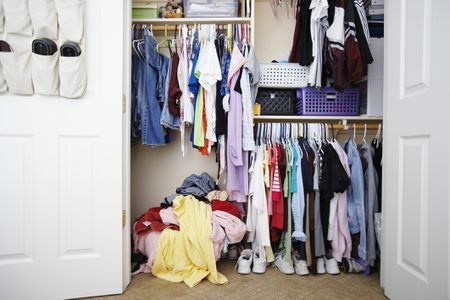 If your closet looks like this (below)...how do you know what you want to wear?!? Get the "List of Spring Basics" this week in your MSP Personal Profile. Use the list to make outfit making as easy as...1-2-3! By planning your wardrobe ahead of the actual season, you'll get what you need before you even need it, which means you are going to have the most stylish season. GET THE SPRING BASICS LIST-this week! Find out what you need to make the most outfits for every spring occasion. Get set for warmer weather--because before you know it, it will be here! Get the list of spring basics & more! Join MissuSmartyPants today! The Answer: MissusSmartyPants and YOU! 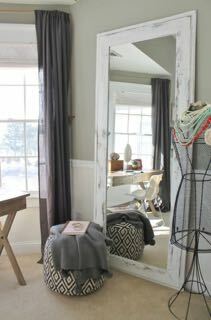 Check out your “rear view” using a full-length mirror plus a hand-held mirror (or a 3-way mirror, if you have one). Look for signs of poor fit (VPL, horizontal lines, puckering) and check that your clothing proportions look pleasing to the eye. Check out your rear view each day this week. Soon you'll see what adjustments you need to make-before you head out the door. I've been following your blogs for a while and I'm debating whether to become a member. I really don't spend a lot of time on myself - the usual, "too busy" story I hear you say! Anyway, I saw your style tip today about slimming your waist by tucking in your top. I do agree that does give the illusion of a more defined waist... Looking straight on. However, turn to the side view and people will ask when the baby is due?! It would be nice to feel confident from all angles. Not every waist slimming tip is for everyone. However, you can dress with confidence-and at all angles. The key is to find what works best for you. MSP gives you the style tools to make it happen…that’s what we’re all about! Perhaps the tucking in tip (best is when the top and bottom are the same color-perhaps a darker color) is NOT the best one for you. You can however, choose from MSP’s other suggestions for top styles that minimize the mid section. Also, another handy tip to help you look slim is by wearing a lightweight “structured” jacket that nips in at the waist. This type of jacket hide any belly rolls and makes you look more defined! Give it a try-even with a tee shirt and a pair of jeans. Stand in front of a full length mirror and look at yourself from head to toe without the jacket, and then, with the jacket. Even snap a photo to see the difference. Without a doubt, with the jacket you will look slimmer and more defined! It's amazing what a few smart tips can do for you. With the help of MissusSmartyPants’ weekly style tips you will dress everyday with style confidence!